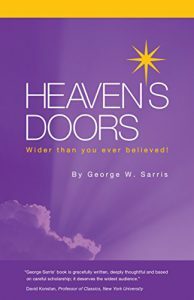 George W. Sarris: Heaven’s Doors: Wider Than You Ever Believed! (GWS Publishers 2017), 270 pages. “Exposing a 1,500-Year-Old Myth about Hell! For the first 500 years after Christ, most Christians believed that God would ultimately redeem all of his creation. Hell was real, but it had a positive purpose, and it didn’t last forever. Then beliefs changed. For the past 1,500 years we’ve been told that most of the billions of people who have lived on this earth will remain separated from the love and mercy of God for all eternity. The moms and dads, grandmas and grandpas, sons and daughters, relatives and friends who have not exhibited the “right kind” of faith here in this life will suffer in hell forever. The idea of hell as a place of never-ending suffering is not taught in the Bible. It’s a myth that was forced on the Christian Church by a power-hungry Roman emperor, was supported by a highly respected but misinformed cleric, and has endured for centuries because it became the status quo.